I installed a Harley Michaelis rotary driver system into the wings of a new Whyte Wings Sapphire open class ship. For the uninitiated, this is a system of transferring the power from servo to flap or aileron that avoids external drag-inducing linkages--the system is completely internal. I had been wanting to try the system, but was reluctant because of the fabrication work involved in making the custom couplers from brass valve caps as was originally done, and frankly because I'd never laid eyes on an actual application of the system. With the advent of the Kimbrough ready-made couplers (Part number #500), I had to give it a try. The diagram at right is from an insert that came with the couplers. For a first attempt, I think it went fairly well, and I only had to repeat a few things to get them right. I believe I would have had an easier time of it if I had seen a previous system installed. To that end, here are images captured with a video camera and PC capture board. Excuse the "barrel" effect that makes straight lines look curved--the camera is only a few inches from the subject in many of these images and does not really have macro lens. You can buy the couplers from several sources--I bought mine from Tower Hobbies, and from Tim McCann's Soaring Products, for about $5 a pair. 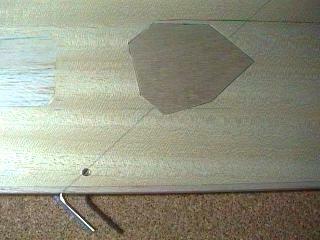 This particular wing had obechi sheeting, and had servo holes already cut out. 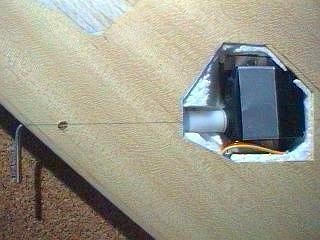 I made a plug of light balsa, and glued it in. 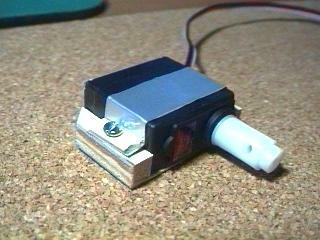 The original servo bays are needlessly far out toward the tip, and the wrong orientation. Besides, I needed the holes slightly further from the trailing edge, in a thicker part of the wing, to accommodate the ridiculously thick HS-205's (ailerons) and HS-225's (flaps) I used. 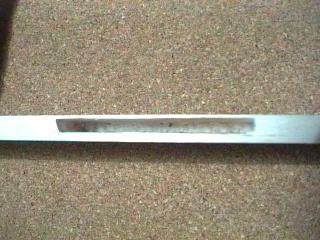 The line parallel to the leading edge is the rear edge of the carbon tube spar and carbon sheet spar caps. 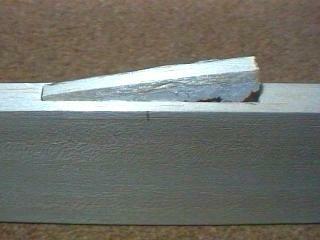 The carbon tube is the same wing joiner tube that you can see at the wing root. The two adjacent lines parallel to the trailing edge is the pre-cut servo wire tunnel. . The servo squeezed between the two. I think a straight shot at the servo wire tunnel helped when I pulled the servo wiring harness through with a hooked piece of music wire. 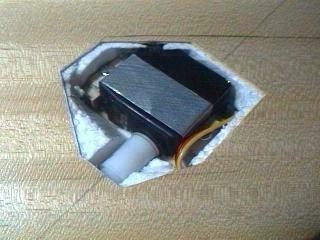 The polygon between the spar and wire tunnel is the servo cover, cut slightly larger than the servo. The moment of truth--cutting the control surface for the pocket installation. Position the pocket vertically as close to the hinge line as you can; put the aileron pockets near the top surface, and put the flap pockets near the bottom surface. Harley says, "In thin surfaces, both can go near the bottom, however."  Pop out the piece of balsa and foam. Use a tiny screw driver to curl out the foam deep enough for the pocket and a little extra--the pocket is recessed a little to make room for the elbow on the drive shaft. The formica and ply pocket is actually a little thicker than the deepest part of the slot in the control surface in this case, because of the taper of the trailing edge. 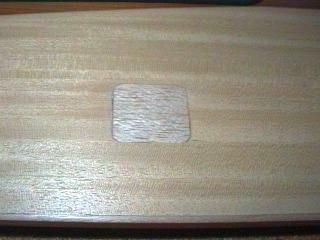 Not shown here, but the other side of the pocket is sanded along its deep margin to allow for the control surface taper. Test the fit. 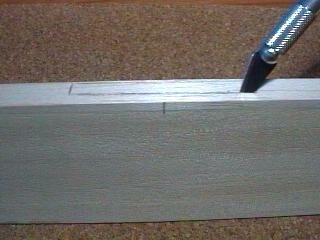 The pocket in this case is made using Formica for the top and bottom, cut from a sample chip. 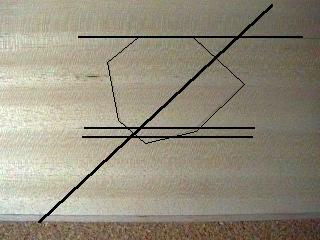 "Spacers" between are pieces of ply. My 3/32" ply was a bit thinner than the 3/32" stainless steel welding rod I used for the drive shafts, so it worked well to assemble the pockets with epoxy and micro-balloons, basically using Mike Garton's method. I used three short lengths of the 3/32" waxed rod for spacing, and glued the assembly together on my desk under glass, weighted with 10 pounds of lead. 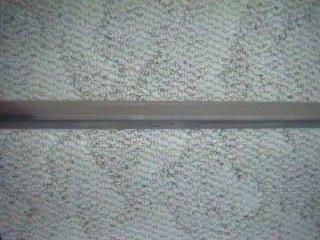 This gives the drive shaft the very uniform snug fit that Harley favors. 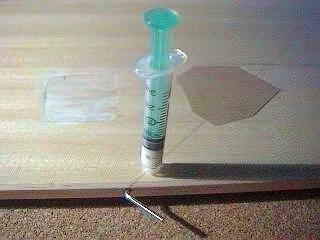 Glue it in. I used epoxy and micro balloons, and I again put in short pieces of the 3/32" welding rod wiped with a little wax to make sure the gap stayed uniform with the pocket pressed firmly in the slot. 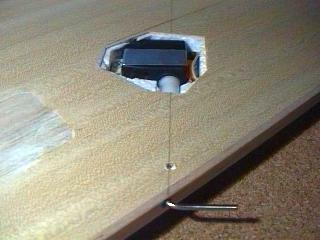 I also clamped the surface to a desk to make sure the control surface did not warp while the epoxy set. 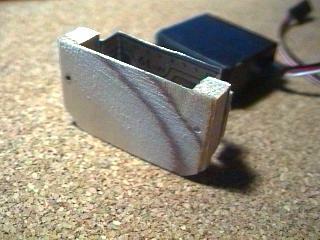 The pockets are recessed a little to allow clearance for the drive shaft elbow. To make the servos removable, I made a set of servo trays. I used a 1/16" ply base, with glued on 1/4" x 1/4" spruce rails topped with 1/16" ply, and a 5/8" x 2-1/4" aluminum strap made from a strip of the side of a soda can (Diet Pepsi I think it was), with a small rectangle of 1/16" ply glued to the aluminum strap ends for an even pull. #4 x 3/8" sheet metal screws hold it together. These servos were nearly too thick for this wing, and I had to sand away nearly all of the ply base on the trailing edge side of the tray. The complete unit. The original thought was to be able to back out the servo by sliding it back in the tray off of the drive shaft, but the servos proved too large to allow the clearance. 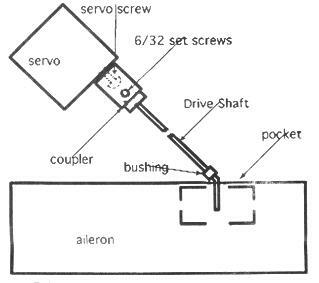 The servo, because of its thickness, had to be positioned against the spar, and could not be backed off of the drive shaft. 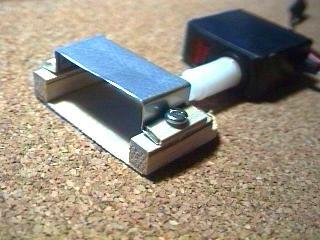 The Kimbrough coupler here has been attached to the servo, but the set screws are not in position. I used 3/32" stainless steel welding rod for the drive shaft and 1/8" outer diameter brass tubing for the bearing, seen here near the hinge line. Tight fit. 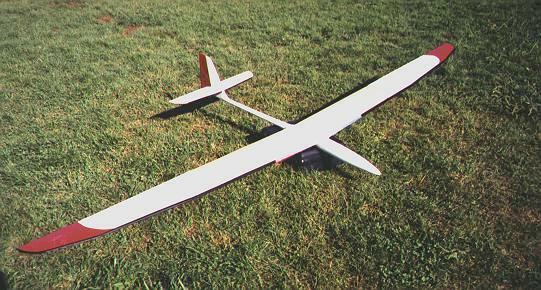 Note the narrow shelf of foam left at the margin of the servo bay, left to allow positioning a servo cover flush to the wing skin. When I glued the trays in, if I had not waxed the bottom of the servos (with ChapStick), it would have been a permanent installation. 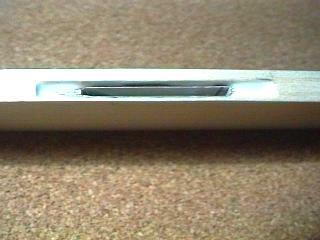 The 1" long brass tubing bearing can be seen through the drilled hole in the wing skin near the trailing edge. 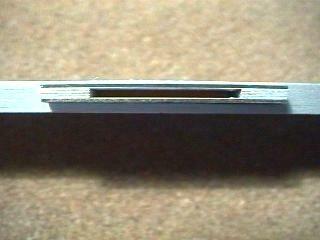 The drive shaft has a ninety degree bend for flaps (but see the update below). 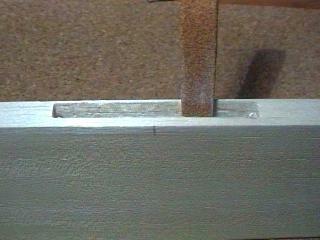 The elbow for flaps is just behind the hinge line, and the elbow for ailerons just in front of the hinge line. I used a regular wood drill to make a hole in the trailing edge, then chucked a sharpened 1/8" brass tube in a drill, and drilled a hole in the foam to the coupler. The hole does not have to be precisely drilled (as I found out), and probably things are easier to line up if the hole is a little oversized. 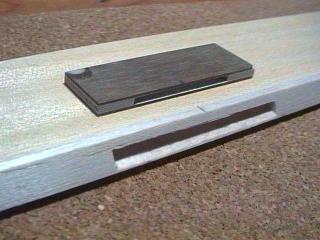 Using the original wing skin obechi piece as a template, I cut and fit 1/32" ply servo covers. HA! See there, you were dawdling along, believing you were understanding everything, and bang! You made the same mistake I did, and had to drill out three of the four brass tubing bearings. Ouch! That photo should show the flap clamped in place to hold the bearing tube and drive shaft in its precise position until the epoxy injected around the bearing sets. Otherwise the drive shaft may bind when the surface is in a neutral position. When glued with the flap or aileron in position, the thing works beautifully. 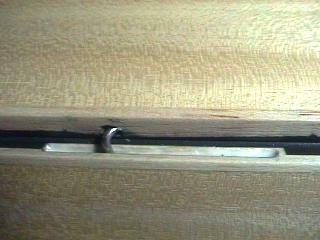 Make sure that the drive shaft is waxed prior to injecting the glue. 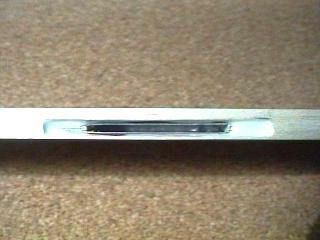 With the flap at about 80 degrees, you can see the drive shaft, the pocket, and a corner of the brass bearing. Once you have it all together, you may need to loosen the set screws on the coupler or loosen the servo in the tray with the flap fully deployed. The drive shaft then can move out or in slightly. Then tighten everything back up, having set the precise position of the drive shaft along its axis for the position of the pocket with the flap in its final hinged position. No need to do this with the ailerons since they only deflect 30 degrees or so. Great picture of my carpet--tough to take a picture of the final product because there is not much to see. This is a picture of the wing from the trailing edge with the RDS flap system in the center. You may be able to make out the servo cover on the bottom surface. Nothing hanging out at all. I wish I had a decent digital camera--the inner third of the wings are in natural obechi . . . pretty! Very clean, and amazingly quiet. I've flown half a contest season with it so far, and everything is working smoothly. I've flown the heck out of the Sapphire. But I dragged the flaps on the ground a few times too many, and they did develop some slop. I took the flap system apart, and discovered that the set screws had worn a little groove in the drive shafts, loosening the system. Also, there was a little wear in the pockets. I could have just tightened up the setscrews, but I thought about it for a while and fiddled with my radio transmitter (offset and travel volume), and discovered that if I decreased the bend in the flap drive shafts to 70 degrees instead of 90 degrees, I would get more power and better centering in the flap surfaces. 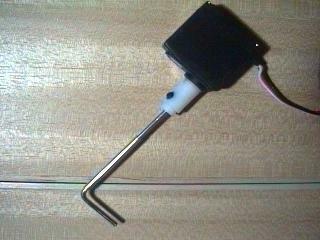 You would have to try it to see how it works, but servos actually can rotate quite a bit more than 90 degrees--more like 120 degrees. So by rotating the servos something like 110 degrees, with a 70 degree bend in the drive shaft, I get 90 degrees of flaps with a lot better power (leverage) and centering. As a bonus for me, the worn spot in the flap pockets are now not the spot where the new drive shafts center, and they are very tight again. I think I could apply this same thinking, with an opposite offset, to the aileron systems, decreasing the drive shaft bend angle to something like 30 degrees, but the ailerons have always worked flawlessly. I’ve installed RDS on two other ships as well since. On a two meter TD ship (a Sleger’s Banshee) that had servo compartments already fashioned and was a conversion from conventional linkages, I glued a thin ply base in the cavity, and then epoxy-microballoon glued the servo in place once the drive shafts and other stuff was in place. In the slope ship (a CR Fun-1), I wedged the two “flaperon” servos in a tight cut-out in the balsa-white foam, and covered it with a piece of "servo cover" tape so that the servo was more or less flush with the bottom surface of the wing, using no glue at all. Both systems are not as easy to maintain as on the Sapphire, but much easier to install--wow, way easier. On these two ships I did use "2-56" push rod stock for the drive shafts, which was a mistake--that stuff is soft and is not at all uniform in diameter (along its length and from rod to rod). I should have used 1/16” music wire or welding rod, but I did get it to work very well.